Anton Yelchin, who in the past few years has yet to disprove notions that he may be part of the next generation of big Hollywood icons, stars as the titular character, whose name really is Odd Thomas. His mother claims it was supposed to be “Todd”, but her sanity is dismissed relatively early. Odd lives in the desert town of Pico Mundo. He’s a cook in a diner, known for a certain flair to his style. His girlfriend is Stormy Llewelyn (Addison Timlin), an ice cream shop employee at the local mall. They’re destined to be together forever (a fortune telling machine they consulted at a fair when they were little kids told them that). Stormy is one of the select few people who knows a certain thing about Odd – he sees the dead, as well the spirits associated with it, namely bodachs, whose appearance is often a forecast of danger. In some roundabout way, he knows the future, and because he knows where crime is, he often goes about fighting it. As a result, he’s developed a semi-rapport with the police chief, Wyatt Porter (Willem Dafoe). One day in August, a strange man with tragic hair named Bob (Shuler Hensley) walks into the diner, surrounded by more bodachs than Odd has ever seen around one person. He is convinced that hell on Earth will descend upon Pico Mundo, and after a brief investigation, it becomes clear that it will occur tomorrow, August 15. Odd then attempts to discover as much as he can, and stop his hometown from experiencing untold levels of disaster. The biggest issue at hand I have with Odd Thomas is its mood swings. There are two forces at work: One is an oddball (ahem) sci-fi dramedy and the other is an supernatural horror film with almost enough conceptual ambiguity for a Lynchian aftertaste. It never knows exactly what it wants to be. One moment, the revelation of a murderous three-person cult is made. Almost immediately afterwards, Odd quips in voiceover, “One more [person] and they could get group health insurance or form a rock band”. When the aforementioned cataclysmic event is discovered in the film’s climax, any jokes from characters quickly fade in acknowledgment of the atmosphere attempting to be built. The film can’t hide its inconsistency in its preceding moments. There are also some qualms that may be attributed to the less-than-ideal history of the film. The first is within the music. In the trailer, you can hear a “Spirit in the Sky”-esque riff. It’s serviceable enough to hear once, but there are multiple instances where it crops up in the film, each appearance making it slightly less bearable. It feels like a placeholder, and any other tracks are forgettable. The other issue is the visual effects, sporadic in quality. The translucent and silvery bodachs look eerie enough, almost between a dementor and T-1000. Other things, namely fire and explosions, look like they’re stranded in some pre-vis purgatory, and while not devastating, could very well take a viewer out of the movie. But it’s not all bad. The acting, especially from the top billed actors, is good. Anton Yelchin does a great job at crafting a likable, yet, well, odd main character. Willem Dafoe’s character has more than a few good lines, and Addison Timlin offers solid support as a vital secondary character. These three offer the basis of a last act plot twist, one of startling clarity and emotion, especially considering Odd Thomas’ spotty connection otherwise with its audience and what kind of movie it wants to be. 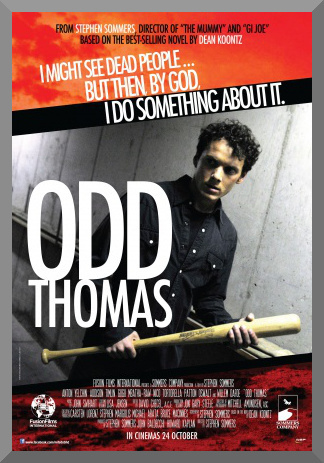 Odd Thomas is a mixed bag. It features great moments offset by hasty and muddy mistakes. I can’t really recommend it to anyone else except fans of the novel it is based on, or perhaps if you like one of the cast members. It goes for so much, but when it finds that style of transcendence, never stays there for very long.